Yes, this speaker is upside down! But that’s sometimes all that’s needed to avoid placing the woofer midway between the floor and ceiling.I have heard somewhere that you should avoid having your tweeters centred vertically in the room — or perhaps it’s just a superstition I somehow developed! Is there some truth in it? I’m so tall that I almost can’t help it! SOS Technical Editor Hugh Robjohns replies: Well, there’s some truth hidden in that advice, but it relates to the speakers’ woofers, not the tweeters. The wavelengths of the sound the tweeters produce is so short that it really doesn’t matter, from a room-mode standpoint, where the speakers are: the reflected sound will be entirely random and chaotic. 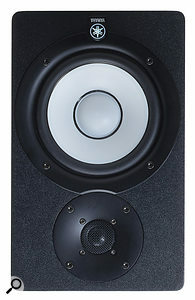 However, it is generally a good idea to avoid placing the woofers on the mid axis of the room (side/side, front/back or — more likely — up/down), because the low frequencies which the woofer produces are likely to be similar to, or integral fractions of, the dimensions of the room, and so you’re more likely to excite strong room modes that way. So it’s much better to have the woofers off the centre room axes. The overall height of the speaker needn’t necessarily change, though — you might find that you can solve any problems you can hear simply by turning the speaker upside down!